ROANOKE, Va. (January 15, 2019) – Lawrence Companies, leaders in the moving, storage, and freight businesses, announced the appointment of Amy Tracy as Corporate Claims Counsel. In this role, Tracy will focus on the legal aspects of claims and risk management. Prior to joining Lawrence, Tracy was senior counsel for Munson, Rowlett, Moore & Boone, P.A. in Little Rock, Arkansas with an emphasis on the trucking industry for more than eight years. In addition, she has practiced in the general litigation department of Glenn Robinson Cathey Memmer & Skaff PLC in Roanoke, Virginia. 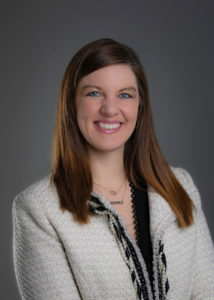 After completing undergraduate studies, Tracy attended law school at the University of Arkansas at Little Rock William H. Bowen School of Law where she earned a juris doctor degree in 2010. Along with her professional achievements, Tracy is involved with the Trucking Industry Defense Association (TIDA) and the Roanoke Bar Association. In 2018 Tracy was selected to join the distinguished Virginia Super Lawyers® list and recognized as a 2018-2019 Rising Star. Attorneys awarded this honor are recognized by their peers for their outstanding work and commitment to the spirit of the legal profession. Their knowledge of the law, professional work ethic, and advocacy on behalf of their clients allow them to stand out among other attorneys in the field. Amy was also awarded the “Best Lawyers” designation for Corporate Insurance by Little Rock-based Soiree’ Magazine for 2016 and 2018. Amy is additionally a former Certified Mediator recognized by the Supreme Court of Arkansas. Having previously resided in Pennsylvania, Missouri, and Arkansas, Tracy is an enthusiastic transplant to Roanoke, Virginia. In their free time, Tracy, her husband, Brett, and daughter, Landry, enjoy hiking the Roanoke Valley’s many trails, and watching their favorite sports teams as a family.